Famous artists and their work are often referenced in literature, media and pop culture so it's never too early to introduce art history into your child's visual vocabulary. Learning about an artist can make family trips to the art museum all the more enjoyable too. Always check your local museum website for child specific programming. You may be surprised by some of the engaging experiences they offer for even the youngest visitors. We studied Picasso faces in our Art History in the Afternoon (ages 6-7) series. As luck would have it, there's a wealth of children's literature featuring Pablo. For this project, we looked at Draw with Picasso and The Boy Who Bit Picasso. I think kids can relate when channeling Picasso's Cubist work because it can be very freeing. Noses don't have to be perfect, eyes don't have to match and skin color, well, the skies the limit! I recommend using China Markers for the portrait outlines, you get a nice clean line and they don't smudge. The Picasso inspired heads were drawn on brown kraft paper and colored in with vibrant oil pastel giving them a subtle contrast. This project was a great success! Thanks Pablo! Ohhh! 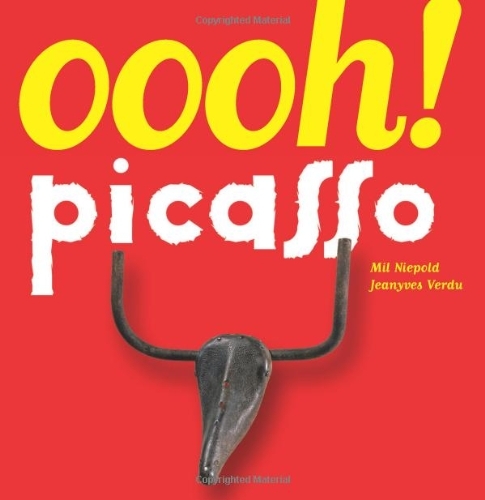 Picasso is great beginning Picasso book!!! For a glimpse into Picasso's mischievous side try-Just Behave, Pablo Picasso.